Looks like it’s time to take a look at the next Equestria Girls film. The first one was pretty fun and it’s always nice to see the Mane 6 in new adventures. I don’t know nearly as much about this human spinoff series as the Pony one, but I am slowly becoming quite knowledgeable on the subject. While this film dials down the stakes and such from the first film, it’s a pretty solid adventure as well. The film’s also quite short, but still manages to give us quite a few songs. I would have liked it to have been a little longer though so we could have seen some of the other teams. The film starts off with Twilight stopping Sunset Shimmer from destroying the world and the effects are felt even as far as a little cafe on the mainland. There we see 3 villains who realize that magic has now entered the human world. They decide that this is the perfect opportunity to take over the world and so they enter the local school singing competition as transfer students. Sunset Shimmer quickly realizes that this characters have some kind of mysterious ability so she gathers the Mane 6 and even brings in Twilight Sparkle from Ponyville. Can these fighters stop this trio of danger or will their friendships be lost to the wind? Right away I did like the opening credits/song that was used to start the movie off. Coupled with the opening scene of the villains it made for a pretty nice way to start the film. It felt cinematic and there was a sense of danger. You always want to start a film off like this even if it was a little misleading compared to where the film would go from there. I always think you need to add something extra when you’re making a TV show into a movie. Something that immediately lets you know that you’re watching a feature film like an amazing animation upgrade (DBZ Broly The Legendary Super Saiyan) or a catchy theme. Rainbow Rocks pulled this off. As expected the soundtrack is top notch as well. The songs are pretty fun although the villains definitely out shined the Mane 6 at least during the concert. Their songs just seemed to be better but the heroes were dealing with a lot of grief that likely held them back. Also you do have to account for the fact that we’ve heard a lot of friendship type songs already so hearing the opposite is always fun. Even in the main MLP movie the villain song ended up being one of the best. There are a bunch of solid songs in the film which are likely the highlight. The animation’s fairly good. In this respect I don’t think it looks a whole lot different from the show or the Youtube shorts, but the animation isn’t bad by any stretch of the imagination. It gets the job done which is the important thing. The transformation forms of the heroes are still a blast even if they didn’t really get to fight here. The character designs are on point as well. If the film falters a little, it’s in the climax just as with the last film. We see the villains transform and you prepare for a big fight as the heroes decide to transform as well. Then the power of music beats the villains so we don’t get a proper fight. I wouldn’t call it disappointing since I think a part of you will maybe even find this to be the expected outcome, but it’s still a little unfortunate. I would have liked to have seen the characters throw down. If anything it would probably be a stomp since Sunset and Twilight can really fight well. The others can sit back and watch the experts at work. Now lets talk about the characters. The three villains are brand new so I’ll start with them. Adagio is the leader of the 3 and typically takes charge. She’s a reasonable villain who tries to stay serious despite one of her lackeys not being particularly competent which always harshes her vibe. Adagio’s plan was well thought out and seemed like it had a great chance at working. I don’t think there were any flaws to her character. Despite this, my favorite member of the villains was Aria. She’s fairly defiant and hints several times that she has ambitions of becoming the leader. She seems to be the most confident as well as the meanest member of the group. I would have liked to have seen her get more of a role. Unfortunately the third character falls flat. She is Sonata and is the token comic relief character of the group. She can’t really comprehend basic english at times and is always getting upstaged by everyone. She never ultimately helps the group out and I can see why the others would constantly get upset at her. She’s likely here to ensure the villain plot never gets too serious or dark but I think cutting her out of the equation entirely would have probably been a good idea. Now lets look at the Mane 6. They are all fighting because of the band and tensions are pretty high. Most of it can be directed at Rainbow Dash as she has decided to be a one person show. She goes on random guitar solos and never lets the others have any creative input. While she is definitely going too far, you can’t put all of the blame on her either. 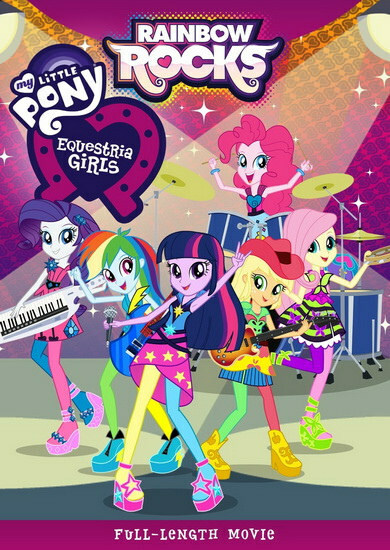 It is Rainbow Dash’s band after all and she was probably hurt that her friends were so quick to replace her as the leader with Twilight. There’s no reason she should have to give up the spot right? Also, the friends were forced to stop her from sweeping the floor with the other contestants during the semi’s since she was playing too good. That’s usually not a problem but in this case it would reveal the Mane 6’s true identities to the villains. All in all, Rainbow Dash was still one of the best characters here as always. She just dances to her own beat and everyone else has to try and keep up. Rarity and Applejack don’t get to do much here but of course they aren’t happy either. Applejack doesn’t like Rarity’s designs and Rarity doesn’t like not having the designs. Pinkie Pie doesn’t do much here aside from constantly complaining that everyone is taking the competition too seriously. If I were the other characters I would agree and then cut Pinkie Pie from the team. Then of course we have Fluttershy who is sad because she’s written a few songs but Rainbow Dash never uses them. I can see why she’s a little upset there, but she should have pressed the issue more. If she mentioned the songs while everyone was around that probably would have forced Rainbow Dash to use them or to at least confront the issue. Twilight Sparkle looks a lot better here than in the last film. That’s because her terrible romance doesn’t pop up quite as often here. I do have to list that subplot as a negative though. Whenever that guy shows up Twilight seems to go crazy and it’s weird since she is usually above such emotions. Twilight is the hardened Princess of Friendship. She oversees it without getting involved with such things. I’m hoping that for the third film this subplot finally dies out. Beyond that Twilight’s plot is about dealing with the high expectations everyone has of her. She gets past it reasonably well. I do have to call her out for another scene though and I’ll include the rest of the Mane 6. So of course Sunset is dealing with a lot of apprehension from the other students since she used to be a bully and almost blew up the planet. It makes sense that the students would take a while to warm up to her, but the Mane 6 are past that right? Well, they constantly bring up the fact that Sunset was evil and like bragging about how they crushed her. It happens a number of times from several of the ponies to the point where it becomes a running gag. Sunset has to constantly say that she’s okay with it, but none of the ponies seem to have any social awareness. They put her in a lot of awkward situations. Then when she calls in Twilight to help and the two had made up from the first film…Twilight acts very stern/uncertain with Sunset. Why would she not take Sunset’s hand when she was trying to help her up? The long hesitation felt really forced since they were on good terms. As for Sunset, she was a great character as expected. She is really the heart of the team. While the Mane 6 are constantly fighting and being meant to each other Sunset tries to be a shining light to them all. She always takes the hero’s route out of a problem and ultimately reminds the team why they are together. Not inviting her to sing with the band was definitely shallow of the team, but Sunset overlooked this for the greater good. I can see why she is generally accepted as the Mane 6’s leader in this part of the franchise. So far she’s done a great job of it and I’d still like to see her fight with the Ponies in the main series at some point. Naturally there are a bunch of other characters who get to appear for a bit through cameos and guest star roles. The DJ character certainly played a pivotal role at the end. Trixie also got a big role although it certainly wasn’t her most heroic role. I can see why she would be upset though since there was a lot of cheating going on during the competition which almost robbed her of the hard work she had put into it. In general I also liked seeing everyone get competitive over the competition even if it was due to a lot of mind control shenanigans at play. Hey, you gotta do what you gotta do right? Overall, Rainbow Rocks was definitely a solid sequel to the first film. I think it’s hard to say if it beats the first one because I always like seeing the group get together for the first time, but at the end of the day we can’t have ties. I’ll say that Rainbow Rocks was an improvement and I look forward to seeing how the next film goes as well. It’ll be tough for the next movie to have as many quality songs as this one since the plot revolved around music here, but I’m sure that the series will think of a good plot. If you haven’t seen this film yet then I recommend it. It’s a pretty fun story about friendship and music. At the end of the day those things are crucial to a good movie. We even have the trope of the big cosmic characters (Luna and Celestia) looking terrible as the new villain shows them up which is always important. This entry was posted in Animated Movie Reviews, Animated Movies, Reviews and tagged Equestria Girls, Fantasy, Film Review, Hasbro, MLP, Movie Review, My Little Pony, Rainbow Rocks, Review by dreager1. Bookmark the permalink.